So, what did you think of the new Aquaman movie? 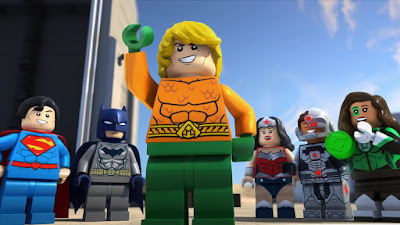 No, we're not talking about the upcoming James Wan DC Film, but the latest direct-to-video LEGO DC Comics Super Heroes animated feature, Aquaman: Rage Of Atlantis. Oh, you say you haven't seen it yet? Well we were recently sent a copy by Warner Bros. Home Entertainment, so why don't we just go ahead and tell you what we thought instead? Aquaman: Rage Of Atlantis once again resorts to demoting the King Of Atlantis to a laughable, often times downright goofy addition to the Justice League. When Arthur gets called away on a mission, Ocean Master takes the opportunity to usurp the throne and place the populace of Atlantis under the control of the villainous Red Lantern known as Atrocitus. Upon returning home alongside Justice League members Superman, Batman, Wonder Woman, Green Lantern, and Cyborg, Aquaman realizes he must relinquish his sovereignty and go on a journey to regain his confidence before returning to his rightful throne - and hopefully before the villains can put the full extent of their plan into play. However, with Superman devoid of powers, Lobo popping to cause all sorts of mischief, and Atrocitus cooking up a secret scheme all his own, it's not going to be a walk in the park for Aquaman and the Justice League. Now, we're going to come right out and say that these LEGO DC Super Hero movies have not been our favorite, but we're also not afraid to admit that we love the DC Universe in all its forms. While we didn't love Aquaman: Rage Of Atlantis, there certainly were some aspects that we did appreciate throughout the feature's 77-Minute runtime. For one thing, the voice cast behind this movie is absolutely stacked with DC icons. The main cast features such greats as Nolan North (Young Justice), Troy Baker (Batman: Arkham City), Grey Griffin (Batman: Year One), and Khary Payton (Young Justice). But, it's the supporting cast that really offers some surprises! Throughout the course of this movie, fans will hear Susan Eisenberg (Justice League: Unlimited) as Queen Mera, Alyson Stoner (Young Justice) as Batgirl, Scott Menville (Teen Titans) as Robin, Jonathan Adams (Green Lantern: The Animated Series) as Atrocitus, Trevor Devall (Batman vs. Robin), Fred Tatasciore (Batman: The Brave And The Bold) as Lobo and Vanessa Marshall (Justice League: The Flashpoint Paradox) as Poison Ivy. Granted, these names won't mean much to casual viewers or the kids at whom this flick is aimed at, but to longtime fans, it offers a wide range of talent from across nearly two decades worth of DC animation. And, despite the film's overall goofiness, we must admit that the cast still did a very impressive job in each of their respective roles! The movie also features it's fair share of Easter Eggs. Again, these probably won't mean much to the movie's target audience, but fans are sure to appreciate the subtle stabs at the complexity of The New 52, Lobo's initial debut back in 1983, and the overall campiness Aquaman has been forced to suffer since the Super Friends era of the 1970s. These and others are sure to keep fans smiling, and make the overly goofy adventure slightly more bearable for you older ones. Additionally, the new flick did feature it's fair share of comedy and, while most of it was groanable, we did find a few chuckle worthy moments spread throughout. Surprisingly, most of these tended to come from Troy Baker's Batman, but Khary Payton's Cyborg was also quick with a quip on multiple occasions. Cristina Miliza also had us laughing in her role as Green Lantern Jessica Cruz, thanks largely to her non-stop banter with a rather snobbish power ring, and Dee Bradley Baker seemed to be channeling some serious J. Peterman vibes in his role as Aquaman. So, in short, Aquaman: Rage Of Atlantis is goofy and groanable, but also really good for what it is. Director Matt Peters has crafted a fun flick that is sure to be enjoyed by kids and longtime DC fans alike, while writers James Krieg and Jeremy Adams deserve a hearty handshake and pat on the back for the amount of clever fan service they've crammed into a 77-Minute script! 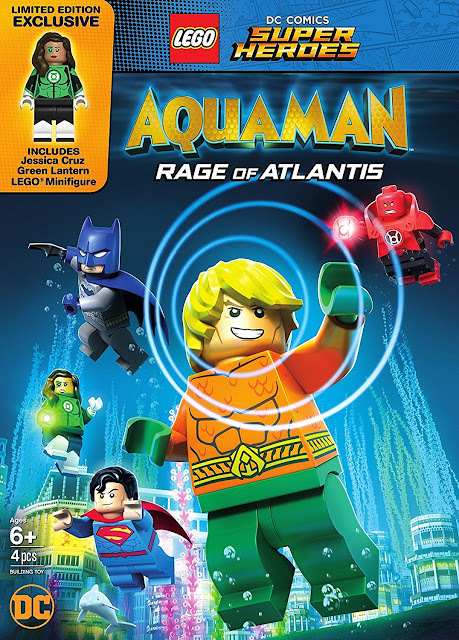 While Chris McKay's The LEGO Batman Movie still remains our favorite DC building block spinoff, we will say that Aquaman: Rage Of Atlantis now currently sits in second place. There's just so many things to really like about this new movie that we're certain DC fans young and old will come away entertained. Granted, this won't be everyone's cup of coffee, but from its strong voice cast, subtle Easter Eggs and bits of surprisingly smart humor, Aquaman: Rage Of Atlantis is certainly a swim in the right direction! LEGO DC Comics Super Heroes: Aquaman: Rage Of Atlantis is available on Blu-Ray, DVD and Digital HD now!